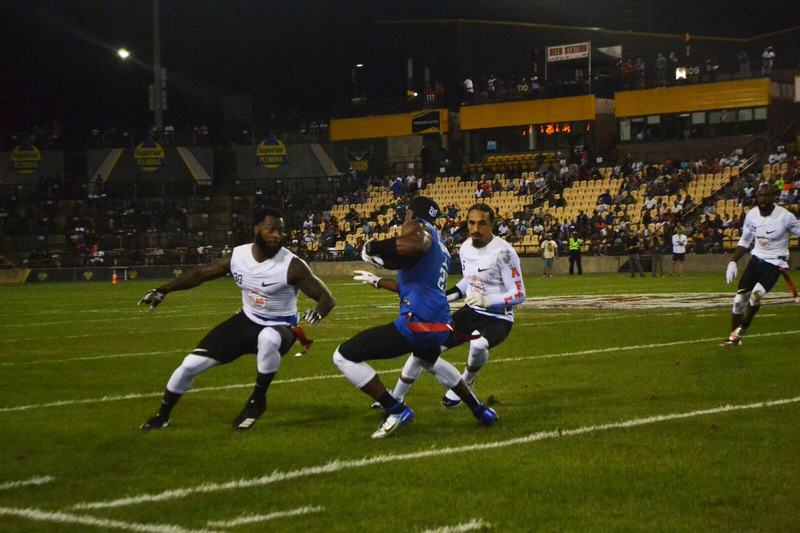 Atlanta Falcons legend Michael Vick returned to the field in Atlanta at Kennesaw State’s football stadium during early July in the American Flag Football League (AFFL)’s U.S. Open of Football Tournament semifinals. Ecstatic Atlanta fans applauded Vick throughout the evening as he ran around and threw just as he once did inside the Georgia Dome. Vick is known for pioneering a new era of quarterbacks who are more willing to use their speed to run and avoid pass rushers. In 2001, he became the first African-American quarterback to be selected first overall in an NFL Draft, and five years later, he rushed for a 1,000 yards, the first time a quarterback did so. Vick led the AFFL game in passing and rushing with 396 and 35 yards respectively. The pro-Vick crowd wasn’t happy to see Vick’s Roadrunners comeback effort fall short as Team Ocho, led by former NFL star Chad Ochocinco, won 25-13. However, the flag football rules had heavy influence on the outcome of the game. Vick completed a pass that looked to be a sure touchdown, but the receiver dove into the end zone to score, a prohibited move. The Roadrunners turned the ball over on downs a few flag pulls later, ending an opportunity to take a 14-13 lead. Unlike traditional football, most deep passes rarely saw double coverage. This may because teams can field just just seven players at once. Ochocinco fell victim to that, flat footing and a great look off by Vick. Vick and Aaron Rouse connected for a 49-yard touchdown on Ochocinco’s island. “The one-on-one defense was very exciting. It causes players to really have to hold their own and defend their opponent. Make one mistake while guarding your opponent and you’re burnt for six points,” Vick and lifelong Atlanta Falcons fan Cedrick Haney said after the game. Vick held an autograph signing before the game, and entry was good to watch two semifinals games from the amateur America’s Bracket and another Pro’s Bracket semifinal. The second game in the Pro’s Bracket featured Olympic champion Michael Johnson and Justin Forsett take on former NBA all-star Carlos Boozer and NBA Dunk Contest champion Nate Robinson. Any time former Buffalo Bills standout running back Fred Jackson gets a chance to compete, he jumps on it. Jackson is still looking for a chance, so it was a no-brainer to join Team Ocho. But there’s one thing the players miss more than competing—the brotherhood that being on a team brings. Three things typically push NFL players out of the league: diminished skillset, injury or lost love for the game. Lost love for the game is a rarity as most athletes have been hooked on competition since adolescence. On the other hand, injury is most likely to push a player out of the league. The NFL Players Association said the average length of an NFL career was 3.33 years in 2016. Jackson joked that if big-hitting safeties such as Duke Inhenacho are on still on the field, athletes will definitely lean more towards the AFFL. If fewer football players pursue NFL careers and they still want to badly compete, the AFFL may have a perfect storm in its hands. Both Ochocinco and Inhenacho believe there’s a serious, viable future for flag football in the US. Haney watched both games on July 7. In the future, he can also imagine AFFL growing, but is a little skeptical. “In flag football, the players are less prone to injury because tackling is not allowed, but on the other hand, the players may be hesitant about going to the AFFL because of the [lack of] money,” Haney said. Flag football is arguably the most competitive intramural sport on university campuses. Professional football is America’s most popular sport and the country has shown it can’t get enough of it time and time again. All NFL games were primarily played on Sunday until CBS broadcast the first NFL game on Monday night in 1966. Thursday Night Football debuted on NFL Network in November during the 2006 season and begins as early as the second week in the 2018 season. Just four teams of elite athletes played in the AFFL in 2018. The 11-game broadcast deal the AFFL struck with the NFL Network is the first ever deal in professional flag football. Former Indianapolis Colts wide receiver Marvin Bracy asked his teammates on the fly what he should be doing during their victory. The amateur players have a better understanding than the former NFL players. The AFFL is nearing the end of its first 132 team single-elimination U.S. Open of Football tournament—two teams in America’s Bracket and Pro’s Bracket remain. The America’s Bracket and Pro’s Bracket finals are played on July 14, and winners battle each other for $1 million in the Ultimate Final on July 19. All games are televised on NFL Network.